What is eternity doing tonight? has become Mega Megane Moé. For the latest posts, please change your links accordingly. The "12 Days of Christmas" series is a joint feature by some members of the Anime Blogging Collective recognizing twelve moments, twelve series, or just twelve things about anime that we've enjoyed over the past year, that really make us enjoy loving what we do, and that is being an anime fan. Feel free to join in the list-making fun too if you wish. We hope you enjoy this feature. With all the hype I've piled on to the visual novel anime, it's only fitting that the third step on the podium belong to a visual novel itself. Although, it'd be - unsuprisingly - wrong to call visual novels and visual novel anime similar. One being animated and one being in mostly still form, the two have to take entirely different approaches to grabbing a viewer's heart. Anime can rely entirely on actions, on visuals, on stunning effects. Visual novels, being of the written form, naturally have to actually use words a lot to paint the picture. It's different from normal books, as visual novels do get still images, and perhaps more important, mood-setting music, but it's still tough to get the reader right where you want them. Which is strange, because in visual novels, the author pretty much leads the reader by the hand. It's tough to visualize what the author does not describe, to hear what sounds are not made, to find the details not presented. It's essentially, up to the author to create their world, down to every last detail and foreshadowing. The pictures, here, serve as supplements rather than the main course. Naturally, visual novels typically have a slower pace as well; you can read at your own speed, pause and put it down anytime, or even go back and read previous scenes. Yeah, the same theory is true for anime, but somehow it seems wrong in a sense to rewind a moving picture, rather than going backwards in a book. There's a sense of broken continuity, to me. But for some reason, one of the things that has affected me most in my year of anime, and now, anime-likes, has been a visual novel. Tsukihime's a stellar read all around, and I'd have to put Hisui's True Ending as one of the most powerful moments of it. "So moe a lot of people did die..."
The one thing that surprises me the most about Tsukihime is that I powered through the whole thing without music. I've always said that sound is one of the most important things to me to establishing the feel of an anime - a good soundtrack, a good insert song, can really make a mood. So, conversely, a lack of sound, not just silence but meaningless silence, should do a lot to detract from it. Yet, somehow, I managed to really be touched by Tsukihime relying solely on text and sporadic CGs. There are a bunch of reasons I could probably cite for this, most of them irrational. Tsukihime was a visual novel I read in my greenhorn days of anime watching, before Kanon, before almost all of the anime I consider important. Likewise, Hisui's path was the second one I followed, after Arcueid's action-packed but somewhat less shocking adventures. That's not to say that preparing for the worst will do you much good at times - take a look at the progressively growing hatred for an unnamed Boat-related series of the Nice variety - but getting completely blindsided by a shocking story (see Self, My/Your) can usually produce emotions far greater than what the former can do. Funnily enough, unlike every other anime character in existence who picks up the boxcutter upon being stunned into the ground by the world turning upside down, I am of the type that almost masochistically enjoys inane plot twists, surprise developments, and complete 90-degree turns of story, provided that there's some semblance of foreshadowing. Funnily enough, my version of 'enjoy' typically doesn't have so much to do with 'enjoying' and more to do with 'being completely slack-jawed'. Perhaps this blend is something that also works in the favor of Tsukihime. 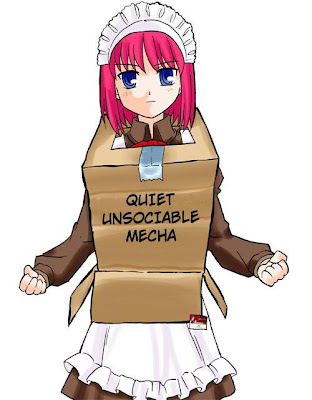 I consider myself notorious for being unable to stomach raw amounts of anything en masse (raw magical girlitude, raw fanservice, raw drama, so on), and so Tsukihime's flips back and forth between character self-development, character relationship-development, and character conflict. Occasionally we get all of those mashed together, in what can only be considered a combination of riveting proportions. The final moments of the Hisui scenario is one of those moments. It'd probably start at the Roa fight. It's actually a scene where Shiki, the protagonist, is not fighting. Rather, it's the two true Tohnos, Akiha and Roa/Shiki facing off. They exchange some charged monologues, about how this whole thing is how Roa/Shiki is the forgotten brother, while the player's Shiki is an imposter who stole his life, stole his sister, stole everything. It eventually culminates in one strike on Akiha's essential power source, her maid Kohaku. The first twist is when Akiha steps in front to take the blow, which drives Roa/Shiki insane (remember, they're siblings, and she's what he's been fighting 'for'). He flees the scene temporarily while Player Shiki dashes over and shares in Akiha's dying monologue. It's a dying monologue of the concluding (rather than plot device) type, do I need to say more? Eventually everyone comes back to what passes for their senses, and Shiki goes and completely wipes Roa/Shiki, who's by now long-gone crazy. Which is, actually, not just 'and they all (minus the dead people) lived happily ever after', but also a bit of exposition on Kohaku, the tragic mastermind behind the series. More plot revelations, revelations, and shock ensues culminating in Kohaku stabbing herself, her vengeful life 'complete'. Unfortunately there is no loli-bunny-ears-girl hidden inside her (see yesterday) to save the day, and so we are subject to the death of the second main character in two scenes. You'd think this would leave the two remaining important people - the couple in this arc, Shiki and Hisui - in quite a wrecked situation, and again, you'd be wrong. Rather, it's sort of a cutting-of-ties from the messy, gritty Tohno life, and all its varied and mildly insane characters. 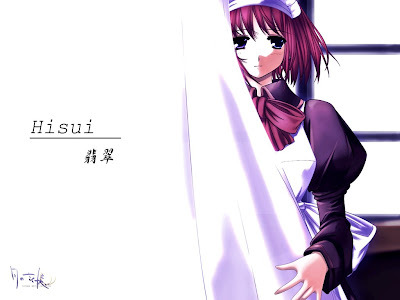 It's an ending of the bittersweet type, where although a lot of the characters are permanently gone, Hisui, as essentially the remaining tie to the Tohno family at this point, vows to open up and truly live the life that her sister could not live, for her sake. All these last moments are incredibly powerful, what's impressive about this ending is that it doesn't just focus on the two 'main characters'. Rather, Shiki and Hisui are essentially spectators to the whole moment. A lot of development is focused on the 'side characters' Kohaku and Akiha, and even the 'villain' Roa/Shiki. They're fleshed out and given suprising amounts of realism. None of them can really be called truly villain nor truly hero; Roa/Shiki acts a lot in revenge and sure comes across as crazy, but he has an almost tragic side to him. Kohaku's whole new levels of gray. This kind of story with no blacks and whites, only grays, are the most intriguing and touching types. It's more realistic, more thought-provoking. Tsukihime is a visual novel with a surprising amount of depth that very few six or twelve-hour anime can come up with. The characters, as fantastical and magical as they are, have very distinct personalities, strengths, weaknesses, and are surprising well-rounded out. Perhaps that's the draw of it - not just the action, not just the drama, not just the moe - but the fact that every character can have an appeal, every character touches the heartstrings in their own way. Maybe it's something about the maids after all. (For research, I cracked open the Tsukihime game again. I had one save file, at the exact moment I was describing. This entry was posted on 12/23/2007 09:12:00 AM You can skip to the end and leave a response. Yeah, Hisui true is one of my favorites also, although since I'm an Akiha fan, Akiha true is my pick for favorite Tsukihime ending. And just a note - Tsukihime does have music. If you used revolve's translation, you had to go through some steps to extract the music and place it in the correct folder, but Tsukihime does have a soundtrack. It's not special or interesting, but it does have one. Akiha's ending was a strong one too, probably my second favorite. To be frank though, I never really liked Akiha until Kagetsu Tohya, but now that I see the interesting (and/or scarily amusing) side to her, I might have to go back and replay Tsukihime, especially with music. I got too lazy to fix it the first time around, but maybe if I'm bored I'll play Tsukihime again with music and see how much better it gets. Blog - hontou ni sou omou?